Sorry that I've been absent. It's been a crazy couple of weeks. My birthday was yesterday. I didn't really do much at all for it, but I did go out to dinner with a whole bunch of friends on Saturday, and my family sent me a package. My way cool secret pal has left me tantalizing hints about a package that should be here any day...how exciting! So, It's begun--I think I've past the point of no return. I'm talking about knitting Christmas presents. I've never done it before, but I can just sense that this is going to get me in trouble in future. I know there's going to be stress and pressure, because I've never had to knit on a deadline before. Does anyone else hear the theme from Jaws, or is it just me? My brother C asked if he were to send me money for yarn, would I knit a scarf for him? Without really thinking I told him that he didn't have to send me money, I'd make him one for Christmas. I was going to use some stash yarn, but I didn't really have anything in the color he wanted. So I had to go to the yarn store and find some. Bummer. I just loathe browsing around the yarn store. (Watch out--there's lightning flying around here!) So I found some navy blue merino/mohair/cashmere blend that I thought was nice. I've experimented with a couple of stitch patterns, but in the end, I think it's going to just end up being a simple k2p2 rib, because I can do that mindlessly and fast. I don't want my knitting to be the source of stress in my life--it's supposed to be a stress reliever. I figured out how to adjust my camera to capture more of a true color when I take a picture in natural light. C's scarf is in the photo above, as of this weekend. I've added a couple of inches to it since then. Today was my half-day off. When I work on Saturdays (which is most weeks) I get off work around one o'clock on Tuesdays. I had all these big plans to be really productive this afternoon. But I woke up this morning congested and cold and feeling pretty blah in general, so when I came home, I crawled into bed and slept for three hours! It felt really good. I must have really needed it, and I feel much better now. I did get some things done today. 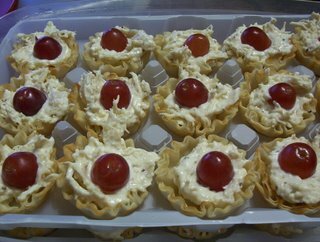 I made some goodies to take into work tomorrow for a birthday potluck. 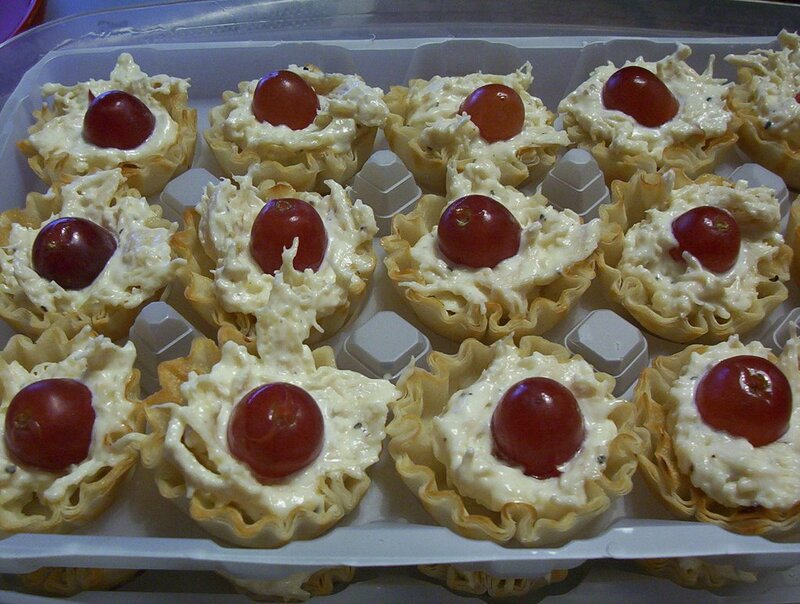 Chicken salad in little pie shells with a half a grape on top. They almost look good enough to eat, huh? I also did laundry and worked on Eris. My camera batteries are charging right now, so no more pictures today. It doesn't look much different than the last time I showed it, just a few rows longer. Scheherazade is moving right along. I've got about six more rows of the first chart done. I'm trying to decide whether I should unzip the provisional cast on and work on the second half at the same time (you make it from the center out, with the two sides mirroring each other). Knowing me, I'd probably get confused as to which side was which, so I'd probably better not. What's with the crazy weather around here? Yesterday, it was sunny and nearly 80 degrees outside. Today it was rainy and never got above 45, and they're predicting snow flurries for tonight! YUK!!! Luckily, I have something new to wear against the cold... This was such a quick knit! I did make some modifications to the pattern. I decided not to do the picot edging at the knuckles because I didn't want them to flare out. I made a few mistakes, too. I was so afraid that I'd run out of yarn before I finished the second one that I knit it much tighter than the first. I think I also messed up one of the cables at the wrist and knit one row too few between cable rows. As a result, it was shorter than the other, and I had six grams of yarn left! 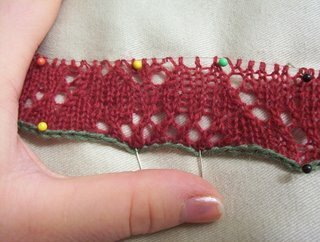 I went back in and added two or three extra rows between where I divided for the thumb and the cables at the knuckles. I actually like it better, because it's tighter and covers a bit more of my fingers. I still have some yarn left and I may go back in and redo the bind-off on the first. I think I'm going to have to go online and see if I can find some more of this yarn and make a hat and scarf to match, and maybe figure some way to make mitten flaps. I'm not sure how often I'll actually wear them if my fingers are always out in the cold. Oh, no, just what I DIDN'T need! There are notecards (I love stationary and paper products!) 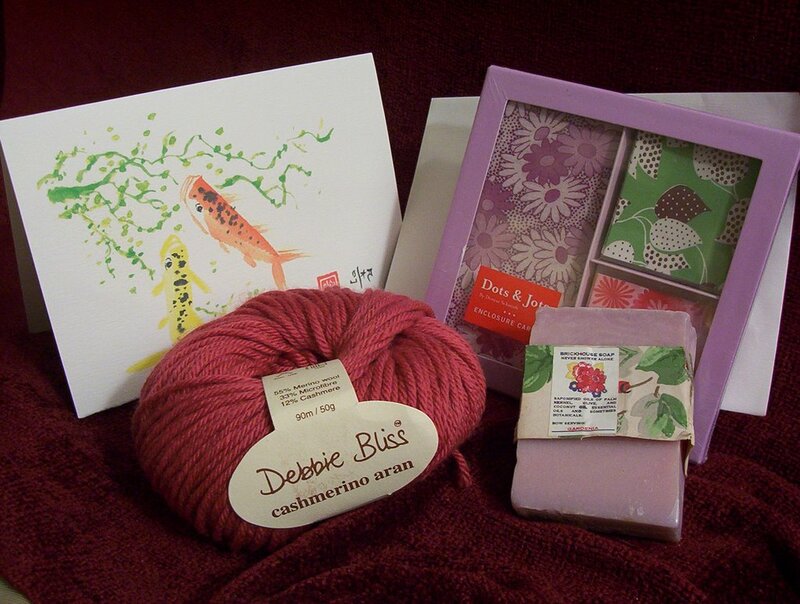 and some Gardenia soap that smells HEAVENLY, and some Debbie Bliss Cashmerino Aran in a great pink color. So now I'm in trouble. First, I told myself this afternoon on my drive home from work (before I knew that there was a package waiting in my mailbox) that I really should stop casting on for new projects before I finish ones I've already started. Case in point: I'm not done with the Bristow cardigan I started this summer, I really ought to redo my roommate's cousin's hat before cold weather sets in, I just started Eris a few weeks ago, and I've yet to cast on for the second Chocolate Raspberry sock. But I'm dying to try Melanie's Scheherazade shawl. So guess what I did tonight. Yup. Lest you think "Oh, that's not so bad," let me tell you what I did while standing in line waiting to vote yesterday morning. Yup. (No, I didn't do all that while standing in line. I'm not that good. I just cast my red yarn onto the provisional crochet chain.) I'm using some laceweight 100% wool I bought on eBay that had been recycled from a commercial-made sweater. I really like how this is turning out so far. The yarnover eyelets really show well, but the solid portions of the shawl are still relatively opaque. I'm using Susan Bates 2.75mm (US#2) This is one of my first forays into lace knitting, and my first stole. And then there's this Gardenia soap. Do real Gardenias actually smell like this soap? Dear secret pal, do you realize that my thumbs are itching to be green and I'm trying to hold them back? I don't really need a new hobby. And my cats eat plants. I just potted some spring bulbs in a planter on my back porch the other day and told myself that was it. But man, oh man, if Gardenias really smell like that soap, I might have to buy a plant. And from what I hear, they're VERY VERY finicky! I certainly am talkative this week--three posts already! I bought some really cute boots tonight for work. I have to wear a uniform where I work, black pants or skirts, black shoes, and blue shirts with the company logo. It's nice to not have to decide what to wear in the morning, but it does get old after a while. We're also supposed to wear hose or black socks. That was fine until last November, when I learned how to knit socks. Who wants to wear store-bought socks when handknit socks are so nice? And who wants to knit black socks when there are so many beautiful sock yarns out there? And knitting with black is hard on the eyes anyway. So I bought some boots that are a little higher than my ankles. Now, when I wear pants (which I do 95% of the time) I can wear socks of whatever color I choose. Take that, you boring old dress code! It's starting to look like a sweater! I worked on Eris yesterday and today. 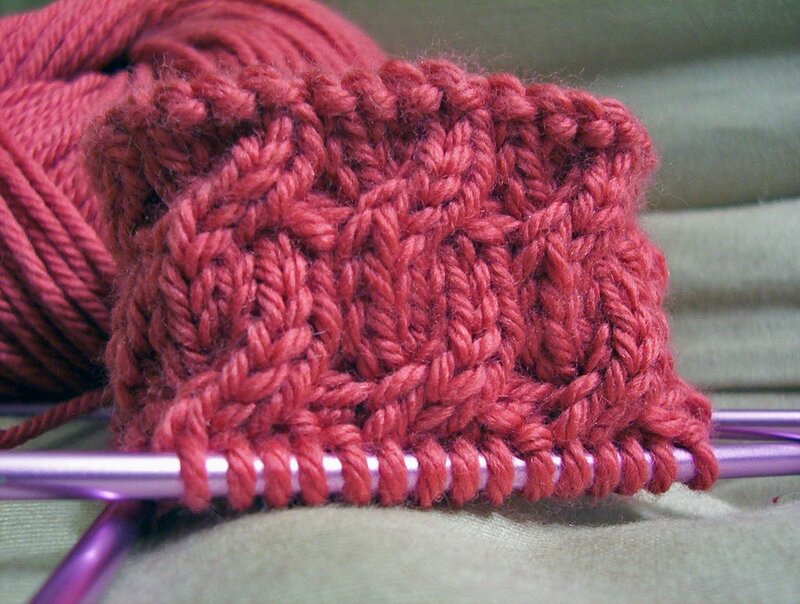 Getting close to benchmark points usually motivates me to knit like mad until I get to that point. 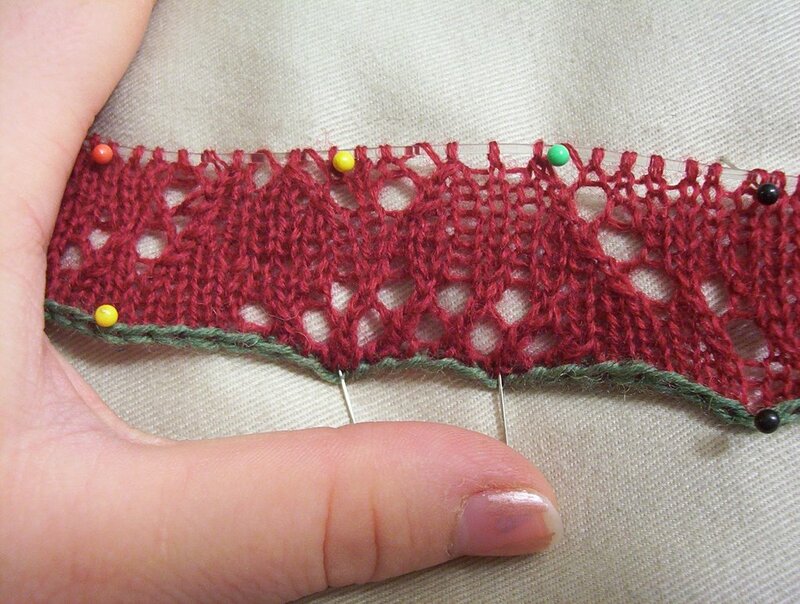 Especially when that point is one (like being able to put the sleeve stitches on a holder) where it means that the number of stitches on a row is significantly smaller because it means that the knitting will grow that much faster! The more that I look at it, the less I am satisfied with my cables on the collar. I see lots of mistakes and they don't look as pretty as the pictures in the pattern. But that's to be expected--this is practially my first experiment with cables. But what I didn't expect was that they're not as pretty as I thought they were a few days ago! I've been told that blocking helps even out stitches in stockinette. I hope that it will also make my cables look nicer.